The owner of a French breast implant maker that sparked a safety scare faces charges of "involuntary injury", his lawyer says. He said Poly Implant Prothese (PIP) founder Jean-Claude Mas, 72, had been freed on bail of 100,000 euro ($130,000). In 2010, France banned PIP implants made with the low-grade silicone, amid fears they could rupture and leak. Mr Mas remained at his home in Six-Fours-les-Plages, in the South of France, while police searched it - as required by French law. He was later taken to the national police station in Marseilles. His lawyer, Yves Haddad, told AFP news agency: "He is not well, he is tired and he is waiting for his doctor." It was thought that he would be investigated for manslaughter but although Mr Mas is still considered a suspect, his lawyer told Reuters news agency that "on the charge of involuntary homicide [manslaughter], the judge decided that for now there is no link". A lawyer representing women who had been fitted with PIP implants said he welcomed the arrest of Mr Mas. "This is a relief. It's come late, but at least it's happened," Philippe Courtois said. "He's been placed in preventive detention. Let's see in the coming hours what his interrogation by the investigating magistrate brings. But what we're really hoping for is his formal investigation, under remand in custody, just to make sure that he doesn't leave French soil during the investigation." Mr Mas told police in an interview last year that PIP had deceived European safety inspectors for 13 years. But he has insisted they posed no threat to health and attacked the French authorities for offering to pay for their removal because it put women through a "surgery risk". He also said he had "nothing" to say to women facing surgery for their removal and that victims had only filed complaints "to make money". Excerpts from Mr Mas's interview have been re-examined by a French magistrate. 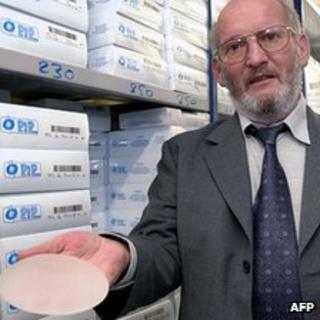 In France, 30,000 women have been advised to remove the implants and 2,700 have filed complaints against Mr Mas. Women in 65 countries - mainly in Latin America and elsewhere in Europe - have received implants made by the company, which closed down in March 2010. But the medical advice in the UK, where 40,000 are affected, is that there is no need for all the implants to be removed, only those causing problems such as pain or tenderness. In England, patients fitted with PIP implants by the NHS will have them replaced by the health service, while it will remove implants from private patients if their clinics refuse. The NHS in Wales said it would replace implants only when it was deemed medically necessary. Scotland's Health Secretary Nicola Sturgeon said concerned women who had them fitted privately would be offered advice and the option of removal if necessary. There are no records of PIP implants being used by the NHS. On Thursday, two more private firms in the UK said they would remove PIP implants free of charge. Transform, which has just over 4,000 UK patients with the implants, had originally said patients would have to pay for removal. It now says those who have had the implants fitted since 2001 can have free removal - but will have to pay around £2,500 for replacements. Those who had replacements since 2006 may still be within their warranty period and would therefore get both removal and replacement for free. The Hospital Group also announced it would offer free removal for patients who had PIP implants fitted between 2001 and 2009 - but would charge between £1,500 and £3,500 for replacements. The international police agency Interpol has said Mr Mas is wanted in Costa Rica over a drunk driving charge. It said the "red notice" over an alleged incident in June 2010 was "totally unconnected" to PIP.